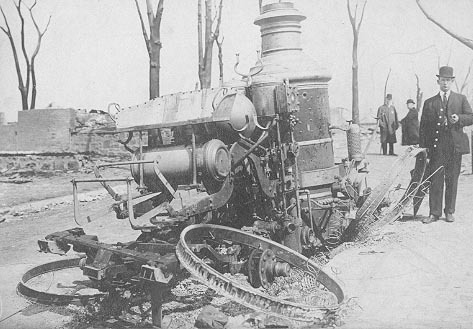 A man stands next to Swampscott Fire Department steamer that destroyed in the Salem Fire of 1914. In the background the devestated landscape is visible. “Swampscott Fire Department steamer burned in Salem fire,” Swampscott Public Library, Swampscott, Mass., accessed April 25, 2019, https://digitalheritage.noblenet.org/swampscott/items/show/157.